Packing up your life and hitting the road isn’t for everyone. In fact, not that long ago it was only for those who were retired. Today, people of all ages are leaving their stick and brick homes and buying a tiny house on wheels. But how do you RV full-time if you aren’t retired? Can you really travel full-time while working from your RV? The answer to “how” is different for everyone, but the answer to “can you” is an easy yes! So what type of work do full-time RVers do while living and traveling from their RVs? The answer? They do everything! Here are some great ideas. If you are skilled in data entry, organizing, and communication, you might be a good fit as a virtual assistant. Virtual assistants work with businesses all over the world, providing backup support. As a virtual assistant you can work from almost anywhere provided you have a good internet connection. If you have the skills to develop and design websites, there is always work for you! Many full-time RVers make their living either working for a company, or doing freelance web design and development work. Publish books, podcasts, online classes, newsletters, and magazines. Publishing is the perfect remote business that can be done from anywhere. Since content is king, editing is queen. Editors are needed for everything from articles and books to court proceedings. Proofreaders are also a growing industry, particularly in the medical and law fields. Do you love helping people succeed in life? A life coach is a virtual career that allows you to live and work on the road. Most coaches meet with clients via phone or Skype. App developers are people who know how to create Android and IOS system applications. They create, market and sell their software for phones and tablets. An App Developer can live anywhere –even an RV! Documentarians unite! From YouTube to Indie films and documentaries, many RVers are recording their adventures for the world to see. They live and work out of their RV while editing, promoting and posting their work. Virtual bookkeepers can work from anywhere as long as they have the proper software and a great internet connection. If you are good with numbers your clients can live in 20 different states and it won’t matter. For those with teaching backgrounds, the online world is awash with opportunities to make a living. You can help kids with math, teach people English, or teach an online college course. Online tutoring connects teachers with students all over the world and can be done from anywhere. 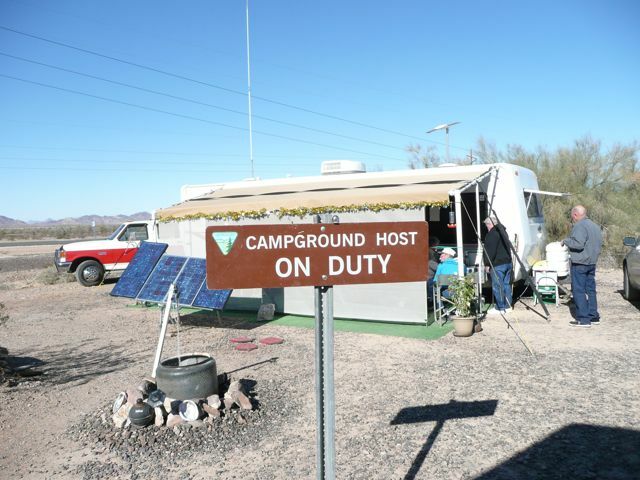 Campgrounds all over the U.S. need help for all camping seasons. Simply choose the state you want to visit, and seek out a campground that needs help running the park. Depending on whether you work for a public or private park you will be compensated with a free sites and maybe a small hourly salary. Be sure to compare your options and consider the hours required before you agree to any job. This job works well for people who want to spend a year in one location. Mobile home parks look for managers to help collect rent and maintain properties. This job is also perfect for those RVers who want to stay in one area for at least one year. Many companies will hire you to secure the location and help run the day to day operations while living onsite in your RV. Amazon hires RVers every year for the holiday season. They have three locations around the U.S. Amazon pays hourly plus provides compensation for your RV site. It’s hard work, but if you stay for your whole contract you will receive a nice bonus! National Parks all hire for the busy season. The Grand Canyon, Yellowstone and Mount Rushmore all look for help from May through September. Most jobs provide an RV spot along with hourly pay and discounts to local attractions. Many amusement parks hire work campers in the late spring and summer time. Help run the park while earning an hourly salary. Some amusement parks provide a free RV space and utilities, while others do not. Be sure to check all of your options before you commit. 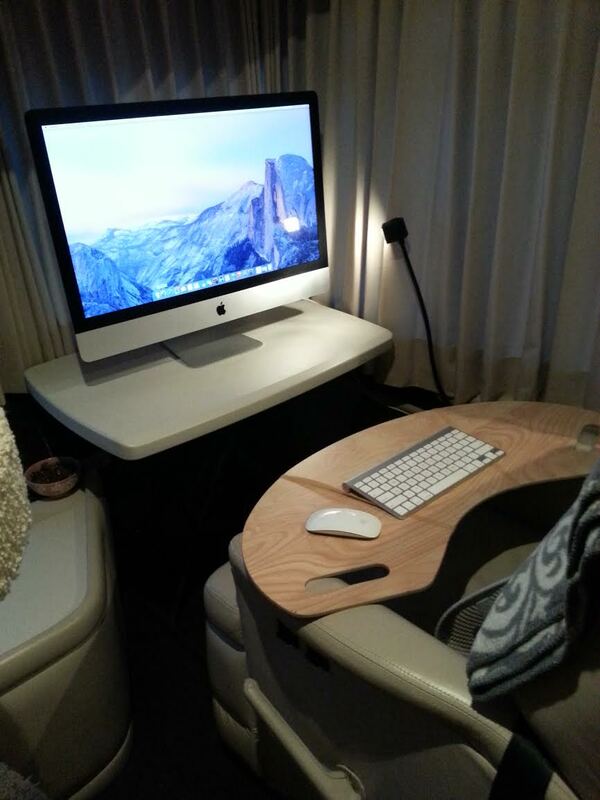 You don’t have to be tech savvy to make a living from an RV. There are a variety of positions around the U.S. that need workers on wheels. These can include people with professional skills. Nurse contracts are readily available, especially in rural areas. A nurse might serve an area for six months to a year with excellent pay and flexibility. Pipeline workers get to travel and enjoy great paying work. Many stay at the same RV park with other pipeline workers. You might also find work with road construction, military contracts or power lines. Gas technicians inspect ground lines by walking all over a region with an electronic meter. If you love to be outside this might be a great job for you. Choose a region and be paid to park, travel, and walk the lines. Check out Southern Cross for more information on this opportunity. Work with your spouse and help keep an oil field safe. There are plenty of jobs available for people who to park on site, monitor the gate and check trucks in and out 24 hours a day. This is a job for 2 people and it keeps you hopping! Pay is $150 a day and up, and includes your RV site, generating and dump station. Want to work like crazy for 4 weeks? 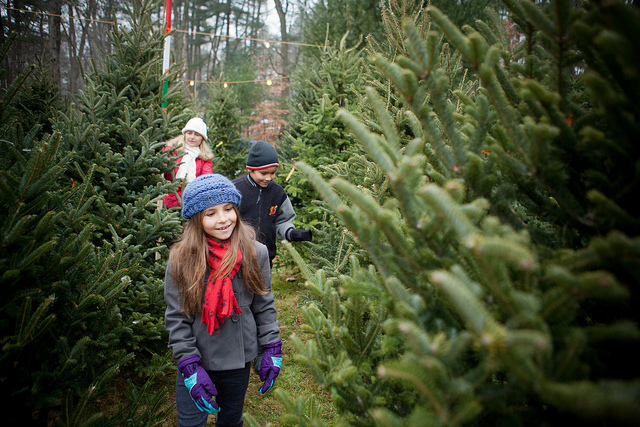 A Christmas tree lot allows you to park, work and make some nice cash. Many pumpkin patches hire RVers to help oversee the patch and keep it safe by parking on their land. This job can sometimes turn into a Christmas tree job if both are done on the same lot. Calendar companies and various companies such as Hockory Farms hire RVers to help run their booths during the holiday season. Do you love the holidays and enjoy huge crowds and busy days? Then working at a place such as Disney World at Christmas could be the perfect opportunity for you! The sugar beet harvest in September is a 2-4 week position that pays really well. If you’re free to go where the work is you can make some good money. Artists are the original nomads. 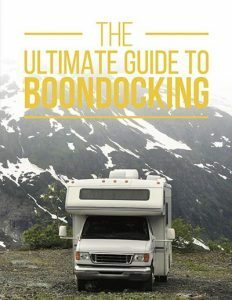 It seems they are born to travel, and the RV life is often a good fit. If you love to create, sell, and promote your work, then you may be able to make a living on the road. Etsy.com provides creative individuals with an opportunity to sell their goods. 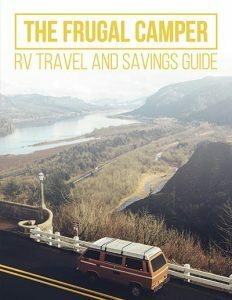 What Type of RV is Good for Working RVers? There is no easy answer for this question. The fact is there are as many RV as there are types of people. Ask yourself how do you love to travel, and what kind of space do you need for your work? Van dwelling is a minimalist’s dream. The van dwelling movement is popular due to the fact that you can go just about anywhere with it, and you can park without people noticing. A van can be as simple as a self converted unit, or as complex (and expensive) as an Airstream Interstate. Living and working full-time from a van is not for everyone, but if you don’t need a lot of space for your work, then this might be the perfect rig for you. Loved by many because they are often affordable and simple to use. Travel trailers are available in a wide range of sizes and layouts for as much or little space as you need. This is a popular choice for many people who already own a full size truck. Fifth Wheels come with no slides, or with 5 slides offering lots of space and storage. 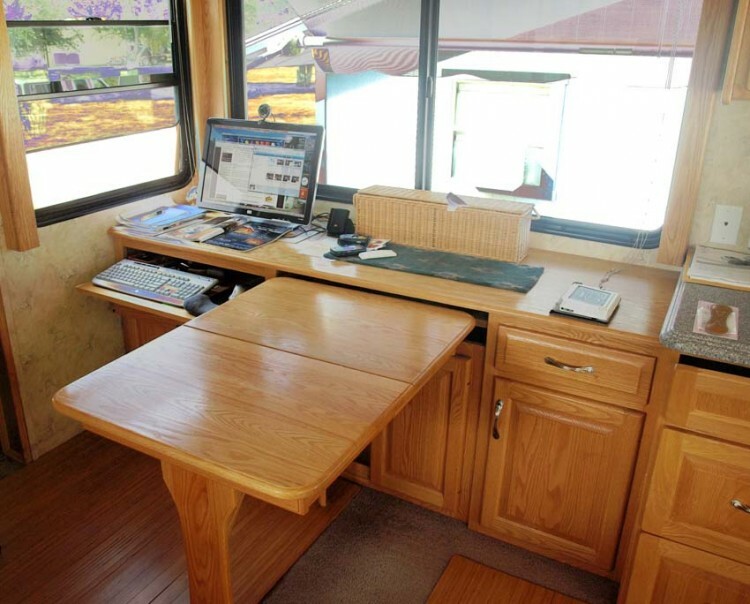 In general, Fifth Wheels provide more space than a trailer, and some have an extra bunkhouse that can be converted into a home office for those who work from the RV. Do you want the complete home on wheels feeling? 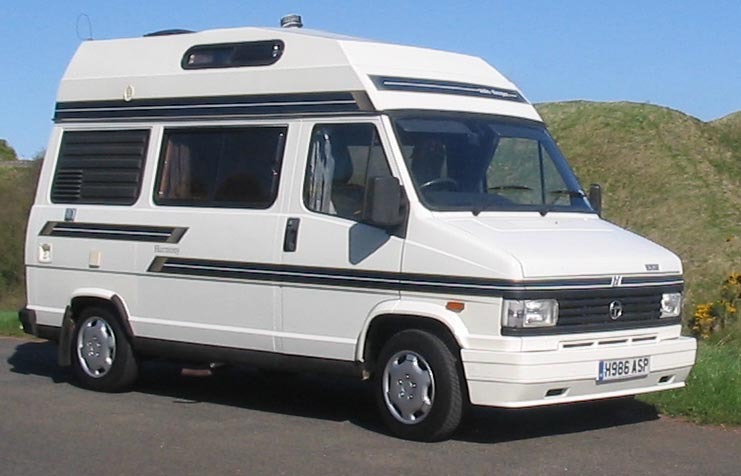 Then you may want a big Class A Motorhome. Even in this category, there are many options from gas driven to diesel pushers and from bus conversions to motor coaches with multiple slides outs. These babies are big and provide a “home like” feeling with plenty of room for offices, work spaces, and storage for work related supplies. Whew! That was a whole lot of information. I hope it got you excited about the opportunity before you. Whether you are 20 or 80 and you want to work full-time or park time on the road… There IS A JOB FOR YOU! What type of work would you like to do while RVing? 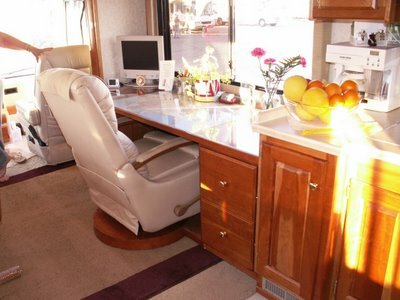 Do you know anyone who works from their RV? Add your comments below. I’d love to hear your suggestions and your ideas. Please share this article with your friends. Thanks!